Please click on pictures to find out more about J.A.BRO'S picture books. a.) 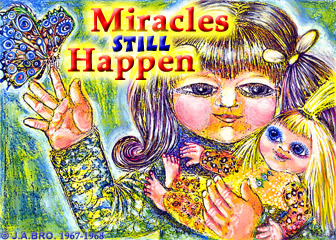 "Miracles Still Happen" 1967/68, is describing in colorful, imaginative pictures and text the metamorphosis from egg to butterfly and offers on the story pages for kids the same story again for adults brought in meaningful, beautiful poetry: J.A.BRO books "For Children And Adults". b.) In J.A.BRO'S children book "Day Time AND Dream Time" 1968/69, science is also combined in a fantasy story to describe, step by step, the first moon landing in 1969 with help of a colorful information story about the space station in Houston, USA, the rocket base and its start, the moon landing of the astronauts with help of the lunar module, etc. These two themes of science books for toddler & preschool kids designed by J.A.BRO, were taken over by a publisher in Spring 1969 after J.A.BRO has shown openly, trustfully but unprotected her two, own created children book creations. 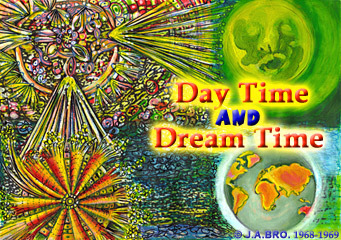 J.A.BRO'S mentioned ideas & science themes were given by the publisher afterwards to two other artists which created again in their own style J.A.BRO'S themes but without the combination of creative fantasy which is essential and actual for preschool kids to be able to understand, consume, store and remember facts of science. Nearly one generation later, 1984, a professor for child development, who has written the foreword for J.A.BRO'S first art-photo book "For Children AND Adults" proved her right. New was to that time too, 1967, J.A.BRO'S own created slogan for books "For Children AND Adults". Today, 35 years later, there is still a market niche for these kinds of books because books for children AND books for adults are separately and differently handled by producing, marketing and advertising. 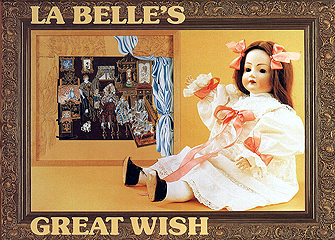 J.A.BRO'S first art-photo book "By Children For Children With Children and Antique Toys" was created in 1977 and own published in 1984 in 2 languages, title: "La Belle's Great Wish". The contents of this book has two main themes: a.) the loneliness of young children and primary school students in our consumer oriented, cold, violent and loveless society, which may have enough food, clothes and a lot of toys to play with but are mainly left alone with their emotional and spiritual development in Daycare Centers far away from a secure, protective and comfortable family life. Grown up the "Key-Kids" may will find after school an empty home of working parents, at a stage of their life they will need their parents most. In her daydreams "La-Belle" is searching for a solution of the problem of emotional loneliness by finding it in the idealistic friendship with two other children which are the living counter part of, for this case selected, antique dolls creating with their similarity to the kid-actors in this book a link between the children world of the past and the children world of today in our motionless high-tech world. The second theme b.) has again the same essential contents like J.A.BRO'S first books from 1967-69 to bring our today's world, with help of creative fantasy, to the understanding and accepting of preschool children including some "pushing thoughts" for the maturer ones. Consequently "La Belle" is experiencing on her day-dream-journey around the world other countries and cities like New York in the USA, Venice in Italy, the Tower of Pisa in Italy and the African jungle which was beautifully painted by the 12 years young "Actress" of the book which is the creator of most of the other unique and colorful children paintings in this book. Her interesting, colorful and absolutely unique painting of the curtain from the "Punch & Judy" theater reminds, in its structure, of the gorgeous paintings of the Australian Aboriginal art despite the fact she never has seen them before at that time. This beautiful, artistic picture book with unique scene arrangements dedicated J.A.BRO not only to her own kids but worldwide other kids too, adults included, by being prepared to donate a part of the net proceeds by sale to needy kids and abandoned animals. 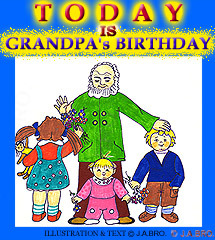 J.A.BRO'S children book "Today Is Grandpa's Birthday" created by J.A.BRO in 1981 for her youngest baby son, is kept in color drawings, thought as a little book for toddlers. Born at the Baltic Sea, this nice story for him contains a trip with the ship to the opposite shore to visit the grandparents where grandpa is celebrating his birthday. This sweet little adventure story is yet to be published and is for sale too, including its copyright. The art-photo book "I Am The Bear Yellowy - Who Are You?" made by J.A.BRO 1987/88, "For Children From 1 year to 100 Years" contains like "La Belle's Great Wish", artistically built photo motives. 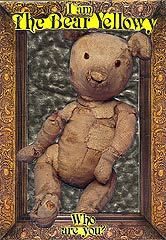 It offers "Three Books In One Book For The Price Of One" The first book contains the emotional story of an antique toy bear representing a disabled child who feels rejected. This story has luckily a happy ending by telling step for step how the positive integration of the outsider into the group of the others happened. The happily done integration leads seamlessly to the story of the second book which shows in beautiful and pedagogically valuable scene arrangements the never ending reign of life & death represented by the four seasons of HOPE in Springtime, RIPE in Summer, HARVEST in Autumn and SLEEP in winter. The third book (84 pages, cover included) is giving in lively scene arrangements information for interested small & tall antique toy bear collectors about all important facts of the items manufactured partly before 1908. The whole book is created by J.A.BRO alone by using for the story antique toys out of her own collections. These facts are a big advantage in view of purchasing the art-photo original book, the color original transparencies of ca. 131, and certainly the copyright of all which can be used for full marketing of the unique & beautiful toy-bear story in one-two-and three dimensionality. This book and all the other beautiful children books by J.A.BRO would give great opportunities for full marketing, including funny, adventurous and pedagogically valuable, meaningful TV series of five, 10 minutes or more. The main characters of J.A.BRO'S children books may give the basis for cartoon series in magazines and TV too.